This is a fine volume that sheds new light on the work of Jean Molinet (1435-1507), whose historiographical work has long since served as an important source for the entangled history of the Low Countries, France and England at the turn of the sixteenth century. This is no mean feat, since it concerns an unusually versatile author, whose activities ranged from prose historiography and prose literature to poetry and music, some of it written "privately", some of it as court historiographer of the Dukes of Burgundy. In all likelihood, it is precisely the very versatility of his work that led many nineteenth- and twentieth-century scholars to one-sided and strangely conflicting interpretations, either reducing Molinet to a fawning propagandist of the Burgundian Valois and their Habsburg successors, or depicting him as a sterile, other-worldly and verbose wordsmith. One of the greatest assets of this volume, which combines the expertise of both historians and literary scholars, consists in the careful dissection of pre-established scholarly conceptions about Molinet in the introduction of Jean Devaux and élodie Lecuppre-Desjardin (the volume includes a useful survey of the older historiography in annex). Showing how earlier interpretations of his work are rooted in questionable assumptions about style and genre conventions, the relations between morality and politics or the classic differentiation between the "medieval" and "modern", their analysis provides the basis for no less than 21 contributions, each dedicated to different aspects of Molinet's textual production. To liberate Molinet from the facile label of a backward-looking, maneristic relic of medieval traditions - a stigma largely based on superficial comparisons with contemporaries who received a better press, above all Philippe de Commynes - the contributions are organized in five thematic clusters which resonate well with important lines of enquiry in current scholarship, ranging from conflict studies to urban history. A first cluster of papers contextualizes Molinet in the urban network of the fifteenth-century Low Countries, a welcome complement to the better-known role of Molinet as a princely courtier. The second and third cluster are directed towards the concepts of violence and ritual as key elements in Molinet's work, whereas the fourth cluster focuses on the historiographical component of his oeuvre. The fifth set of papers is largely dedicated to what one might describe as the content of the form, with contributions of literary historians using the formal component of various treatises, poems and prose texts as access to Molinet's intellectual aspirations and techniques. Whereas it is impossible to do justice to each of the contributions in the volume - the introduction offers a fine summary - it is clear that together, they provide a careful reassessment of Molinet and his work by focusing on three elements. 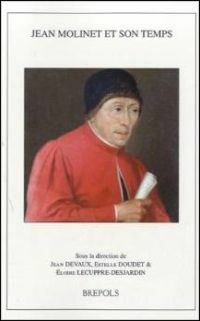 First, the social context of Molinet's life as a canon in Valenciennes and as princely courtier (and how it influenced his work) is treated. Light is not only shed on the political crisis of the 1480s, but also on shifts in religious practice within urban communities, respectively discussed in the contributions of Jelle Haemers ('Autour de Jean Molinet. La mémoire collective à la cour habsbourgeoise et l'alternative des élites urbaines en Flandre (XVe-XVIe siècles)) and Anne-Laure van Bruaene and Susie Speakman-Sutch (La dévotion des Sept Douleurs de la Vierge Marie aux Pays-Bas: propagande princière et sensibilité urbaine). In addition, the theoretical basis of Molinet's historiographical work, based on precepts of Christian theology as well as more specific fifteenth-century traditions - see in particular the contributions of Jeff Rider (Les métamorphoses historiographiques chez Jean Molinet) and Jean Dufournet (Commynes lecteur et correcteur de Molinet) - come into play, and last but not least, the identification of the author with specific literary traditions as expressed in his adoption of specific stylistic and narrative constructs is analyzed. By exploring the interplay between those elements, the volume provides a perspective on Molinet in which his literary style becomes understandable as a functional rhetorical mode, however foreign it might seem to a modern reader. This approach not only reflects how Molinet's work corresponded to the demands of the society in which he lived, but also reveals Molinet's modus agendi in selecting and framing his subject matters. The result of this carefully edited volume is perhaps not a fully coherent interpretation of this elusive author, but it provides a solid basis for future research.